We’ll be adding more and more to this section soon. by affirming the work of Copp School. Copp is a cluster of farms and houses on the top of a small hill half a mile south of Great Eccleston. It was here that a chapel was built in 1723 for the members of St. Michaels on Wyre Church and Kirkham Church who found difficulty (because of the distance) in attending their parish churches. Elswick Chapel would have been ideal for the purpose, but as it was in the hands of dissenters the bishop of the time, Bishop Gastrall, decided a new building would be preferable. So, St. Anne's Chapel was built at Copp - the name cop or copp comes from an old Saxon word Kopff meaning the head or top of anything. On May 13th, 1723, in the reign of George I, a deed was drawn up arranging for three men to rent a piece of land known as Higher Cop for one peppercorn a year to build a chapel. 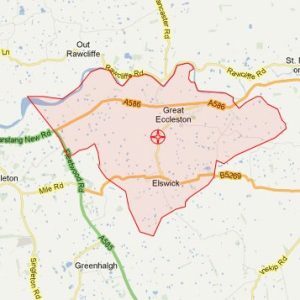 John France, of Little Eccleston Hall, William Gaulter, of Great Eccleston and William Turner, of Elswick were to rent the land from Thomas Dobson, of Great Eccleston, but the following day they bought the land for £5. Building started immediately. The chapel was a plain brick building with four windows on either side and a recess at the west end for a vestry. The floor was of puddled clay and it was not until 1804 that it was flagged at a cost of £11 9s. 6d. - a sum which also included some minor repairs. Records state that 32 vards of flags were used for the two 16ft. aisles and 6ft. of flags for the area in front of the Communion Table at 2s. 8d. per yard. The pews had doors, and in the body of the church was a 6ft. high stove used for heating. The stove was fired with the aid of a ladder, a job often performed during a service to the distress of the officiating minister. The gallery was probably part of the original structure as there is no record of it being added. The pulpit was in the centre of the building. hiding the Communion Table - a Georgian idea of church furnishing. The pulpit was three-decker, with a clerk's desk at the base, a reading desk in the centre, and the pulpit at the top. The outside of the chapel was whitewashed every year, and the inside walls, too, were white. In the vestry today can be seen a table carved" TR 1725." This is almost certainly the first Communion Table the church had installed or even made by the first curate, the Rev. Thomas Read. 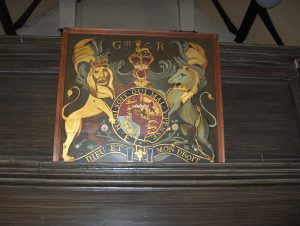 In 1818, the Kings Arms were hung in the chapel - the Arms were placed in churches where grants of money had been received from Parliament as a thank-offering for the successful end of the Napoleonic War. An assessment of pewowners was made whenever money was needed for repairs, and in 1840 single pews were assessed at £2 10s. and double pews at £5 to cover the cost of alterations and enlarging the chapel. During these alterations a bay was added at the east end for the Communion Table and the tower was raised. The following year land was bought to extend the churchyard. The present "big bell" was bought from the churchwardens of Kirkham Parish Church in 1846 for £70 14s. 3d. The small bell was probably the original one used in the chapel. Copp Parish was formed on January 5th, 1849, by an Order in Council at Queen Victoria's court at Windsor. The chapel became the parish church, a position it had fulfilled in all but name since it was built. Originally part of the large Chester Diocese, at this time Copp came under the new Diocese of Manchester, and became part of the Diocese of Blackburn when it was formed in 1927. A plaque on the left of the church records that £400 was paid in 1731 for a farm and land at Out Rawcliffe; further land was bought in Copp Lane in 1767, also for £400; in 1811 £500 was paid for land next to the Vicarage. Services at the old chapel were very simple. The psalms were probably read and the hymns pitched by the Clerk supported by the choir. There is no trace of any musical instrument being used until 1841 when 14s. was paid for a clarinet and 13s. for a bass viol. These, together with one or two violins provided the music. Later a harmonium was bought, and in 1886 an organ was purchased for £160. The East window was put in in 1884. It was given by Mr. J. T. Hathornthwaite, Rector of Elphinston College, Burnley, in memory of his father who was vicar of Copp from 1841-1864. The centre window shows the crucifixion, with S1. Anne on the right and St. Thomas on the left. A prayer desk in memory of Mr Hathornthwaite, who was born at Copp Vicarage in 1845 was given by his daughter in 1922. The church was completely restored in 1884. 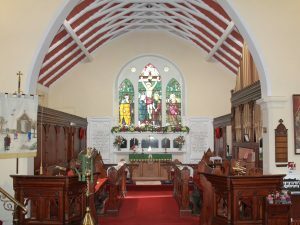 A new chancel was built, the old arch widened, open pews were installed with choir stalls in the chancel. The font was moved from the body of the church to the old vestry, and a new vestry was built adjoining the chancel. The outside was transformed by building over the old structure with Yorkshire stone, and the tower was raised to 45ft. The total cost of alterations was £1,000. On the right hand side of the church is the "Good Shepherd" window, dedicated to the memory of the Rev. Charles Pakes, vicar of Copp from 1880-1907. There have been many gifts to the church over the years. 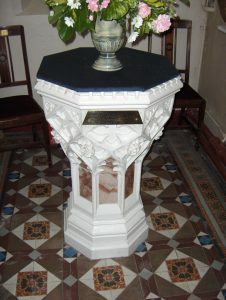 The brass lectern was given in 1908 by Thomas Fisher and his children in memory of his wife, Margaret, and her uncle, Robert Hankinson Williams. The brass cross was given the following year in memory of BOLD MELLAND ROBINSON, by his wife. That year the organ was rebuilt and enlarged. The reredos and communion table were erected in memory of the twelve men who gave their lives in the First World War; a plaque to the right recalls those who died during the Second World War. The brass collection plates were given by the mother of Edward Lakeland WiIliams Garlick, killed April, 1917, aged 21, and Mercy E. M. Garlick, died July 1918. The font is in memory of Dr. Thomas Fisher, who died in 1917, given by his children, while the Baptistry window commemorates the church's bicentenary in 1923. In 1920, ten brass hanging lamps replaced the old wall lamps in the Nave and Chancel, the Baptistry floor was tiled and the aisles covered with cork lino. The Chancel was first carpeted in 1933, a gift from Mrs. Hogg in memory of her husband, Henry. The Rev. A. J. King came to Copp in 1927, and was vicar there for almost 20 years. Towards the end of the Second World War, Rev. King became chaplain to the Army stationed at Rawcliffe Hall - and church parades were occasions to remember, with the uniforms and the air of pageantry. Electric lights replaced the old oil lamps in 1933, a few months after electricity was brought to the village. In 1936, Mrs. Jessie Parkinson organised the first Flower Queen Festival, something she then did annually for over 40 years. The festival changed several times, and for a few years was held on the vicarage lawn, but later reverted to its original form of a short service in church, the crowning of the Queen on the field, followed by maypole dancing. A wooden seat stands outside the church, to the right of the porch. It was given in memory of John Whalley of Elswick who was churchwarden 1908-1935, and church treasurer 1913-1935. The window on the left of the church, of David with his lyre, was put in the church in 1940 by Mrs. Parker, in memory of her husband, David Thomas Parker, who was a churchwarden for 30 years and chorister for 60 years. The Rev. Raymond Bell came to Copp in 1946. At this time small pieces of freshly cut bread were still served at the Communion Service, and the introduction of Communion wafers caused quite a stir and several raised eyebrows at such" High Church" innovations. Until this time there was only a cross on the Communion Table, then in 1951, Mrs. Bell's sister, Miss Gladys Rushforth gave the candlesticks. The same year, a silver Communion wafer box was given in memory of E. N. J. Shawcross and silver warden staves were given by Mr. and Mrs. Jim Clarke in memory of Mrs. Clarke's mother, Mrs. Annie Sharples. There used to be an active Ladies' Committee in the village, the members holding sewing meetings and sales of work. They donated the superfrontals and an oak cupboard (in the vestry) to keep them in. Then in 1948 Mrs. Bell formed the Mothers' Union. The" Resurrection" window on the left of the church, showing Mary meeting Jesus in the garden, is in memory of the forebears of Annie Hall who worshipped in the church since it was built in 1723. Annie Hall died in 1948 and the window was put in in 1959. The hymn-book cupboard at the rear of the church was given in 1953 in memory of Roger and Margaret Parker, of Little Eccleston, by their children. The Rev. Joseph Hamer was vicar of Copp from 1961-1967. During that time oil-fired central heating was installed, the church was re-decorated and the chancel re-carpeted, (the carpet a gift from the Mothers' Union). The first choir robes - blue cassocks and white surplices - were bought in 1963 with a bequest from Miss Lillie Hutchinson, A tapestry worked by her mother, Mrs. William Hutchinson, and her sister, Miss Belle Hutchinson was donated to the church in 1966 by their descendant, Mr. Arthur Hutchinson. The tapestry shows the meeting between Moses and Aaron, although there was some confusion about the subject as the costumes were not historically correct. The Rev. 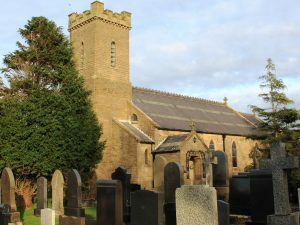 Edward Barrett came to Copp in 1967, and in 1969 Copp Church won the Blackburn Diocese Best Kept Churchyard award, receiving an "Exceptional Merit" commendation in 1970 and again in 1971. The Church also won the Best Kept Village Church award in 1971, the year the present Day School celebrated its centenary. References to a Day School in other buildings go back to 1686 and before. Ever since the church was built it has had close ties with the school, and from 1866-1871 the school was held in the Vicarage barn. The Rev. Alfred Blackshaw came to. Copp in 1972. The 250th anniverasy year saw two important additions to Copp Church. On March 4th the new" St. Anne" window was dedicated by the Rev. G. Gower-Jones, Archdeacon of Lancaster. It shows St. Anne with her daughter, the Virgin Mary, as a little girl. It is in memory of Miss Ellen Bradshaw, a former teacher at Copp School, and a regular worshipper at the church. The second gift, a silver chalice (lined with silver gilt) and a silver patten, are to be dedicated on St. Anne's Day, July 26th. They are the gift of Mrs. Phyllis Dixon in memory of her parents the Rev. and Mrs. A. J. King (a former vicar of Copp).